Adjuvant System AS01 is a liposome-based vaccine adjuvant containing 3-O-desacyl-4′-monophosphoryl lipid A and the saponin QS-21. AS01 has been selected for the clinical development of several candidate vaccines including the RTS,S malaria vaccine and the subunit glycoprotein E varicella zoster vaccine (both currently in phase III). Given the known immunostimulatory properties of MPL and QS-21, the objective of this study was to describe the early immune response parameters after immunization with an AS01-adjuvanted vaccine and to identify relationships with the vaccine-specific adaptive immune response. Cytokine production and innate immune cell recruitment occurred rapidly and transiently at the muscle injection site and draining lymph node postinjection, consistent with the rapid drainage of the vaccine components to the draining lymph node. The induction of Ag-specific Ab and T cell responses was dependent on the Ag being injected at the same time or within 24 h after AS01, suggesting that the early events occurring postinjection were required for these elevated adaptive responses. In the draining lymph node, after 24 h, the numbers of activated and Ag-loaded monocytes and MHCIIhigh dendritic cells were higher after the injection of the AS01-adjuvanted vaccine than after Ag alone. However, only MHCIIhigh dendritic cells appeared efficient at and necessary for direct Ag presentation to T cells. These data suggest that the ability of AS01 to improve adaptive immune responses, as has been demonstrated in clinical trials, is linked to a transient stimulation of the innate immune system leading to the generation of high number of efficient Ag-presenting dendritic cells. Many Ags contained in subunit vaccines are inherently inert proteins or glycoproteins. A common strategy to boost Ag-specific B and T cell adaptive responses through immunization is to include an immunostimulanting adjuvant in the vaccine (1–3). The ability of adjuvants to trigger early inflammatory signals, to increase Ag uptake, and to activate APCs is thought to be crucial for the efficient induction of adaptive memory immune response to vaccines (4, 5). The Adjuvant System AS01 is a liposome-based adjuvant that contains two immunostimulants MPL and QS-21 (2). MPL is a nontoxic derivative of the LPS from Salmonella minnesota and is a TLR4 agonist (6). It can stimulate NF-ĸB transcriptional activity and subsequent cytokine production (6). MPL directly activates APCs such as dendritic cells (DCs) to produce cytokines and elevated levels of costimulatory molecules (7–9). QS-21 is a natural saponin molecule extracted from the bark of the South American tree Quillaja saponaria Molina (10) (reviewed in Refs. 2 and 11). The early evaluations of QS-21 as an adjuvant demonstrated that it could promote high Ag-specific Ab responses and CD8+ T cell responses in mice (12, 13) and high Ag-specific Ab responses in humans (14). The CD8+ T cell responses induced by saponin-based vaccines presumably occurred through the promotion of Ag cross-presentation in DCs (15, 16). However, specific receptors and signaling pathways induced by saponin-based adjuvants have yet to be clearly defined. AS01 is included in a number of candidate vaccines against infections such as those caused by Plasmodium falciparium (malaria) (17, 18), varicella zoster virus reactivation (shingles) (19), HIV (20, 21), and Mycobacterium tuberculosis (22) for which both Abs and T cell immunity are thought to be involved in protection. During the preclinical and clinical evaluations of these candidate vaccines, both Ag-specific Ab and CD4+ T cell responses have been consistently observed, suggesting that AS01 promotes these adaptive responses irrespective of the type of Ag used (2). In the case of the malaria vaccine candidate, these adaptive responses have been associated with protection against malaria in various clinical trials (23–26) and have supported the selection of AS01 over other adjuvants (2, 23, 27). Given the known immunostimulatory properties of the AS01 constituents liposome-based MPL and QS-21, the objective of this study was to describe, in mouse models, the early innate immune parameters induced by AS01 after immunization and to identify relationships between these parameters and the Ag-specific Ab and T cell responses raised against two model Ags, glycoprotein E [gE from varicella zoster virus (19)] and OVA. The Ags (clinical-grade) gE (19), Alexa Fluor 647–labeled gE, and the Adjuvant System AS01 were produced at GlaxoSmithKline. One human dose of AS01 contains 50 μg MPL (GlaxoSmithKline), 50 μg QS-21 (Antigenics, a wholly owned subsidiary of Agenus, Lexington, MA), and liposomes. OVA was obtained from Calbiochem and confirmed to be endotoxin free. Alexa Fluor 647–labeled gE and OVA were produced using the Alexa Fluor 647 Protein Labeling Kit from Invitrogen, according to the manufacturer’s instructions. Animal husbandry and experiments were ethically reviewed and carried out in accordance with European Directive 2010/63/EU and the GlaxoSmithKline Biologicals Policy on the Care, Welfare and Treatment of Animals. C57BL/6 mice were purchased from Harlan Horst, and OTI and OTII mice were purchased from Charles River Laboratories. The i.m. injections were performed in 6- to 8-wk-old female mice, in both hind limbs, in either the gastrocnemius or tibialis (for histochemistry) muscles and in a volume of 10 μl/muscle (unless stated otherwise). Mice (n = 26/group or n = 16/group) were immunized at days 0 and 28 with different injection regimens where AS01 (1 μg QS-21 and 1 μg MPL or 5 μg QS-21 and 5 μg MPL in 25 μl), which represents 1/50th and 1/10th of the human doses of AS01, respectively, and gE (1 or 5 μg in 25 μl) were either mixed together (50 μl) or injected separately (25 μl each). Ag alone (1 or 5 μg) was injected in 50 μl. The i.m. injections were given at the same time or at separate times (with AS01 being injected from 1 h to 7 d before the Ag) at the same site or at contralateral sites into the gastrocnemius muscle. Anti-gE and anti-OVA Ab concentrations (in ELISA units per milliliter and defined by internal standards) were measured by ELISA, following a protocol described previously (19), with a minor addition: for the measurement of anti-OVA Ab concentrations, 96-well ELISA plates were coated with an overnight incubation at 4°C of 10 μg/ml OVA in PBS. To assess Ag-specific T cell response, splenocytes from immunized mice were stimulated in vitro using 107 cells/ml (96-well microplate) with gE or OVA peptide pools of 15-mer with 11-aa overlap at 1.25 μg/ml (from Eurogentec) and 1 μg/ml (from Neosystem), respectively. Anti-CD49d and anti-CD28 Abs (1 μg/ml) were added to the culture, and the cells were incubated 2 h at 37°C. Brefeldin A (1 μg/ml; BD Biosciences) was then added to inhibit cytokine secretion, and cells were further cultured overnight at 37°C. Cell staining was performed as described previously (19). For the experiments with the mice with chimeric bone marrow cells (see below), flow cytometry was performed with a similar protocol with some modifications. The following Abs were used for extracellular staining (30 min at 4°C), anti-CD8 PB (eBioscience), anti–CD3-APC-Cy7 (BD Biosciences), anti–CD4-PE-Tr (Invitrogen), anti-CD44.2 AF700 (104; eBioscience), anti–FcyRII/III-2.4G2 (Bioceros BV), and eF450 dead-cell identifier (eBioscience). Subsequent intracellular staining was performed using the Abs, anti–IFN-γ-PE-Cy7 (eBioscience), and anti–IL-2-allophycocyanin (BD Biosciences) on cells that were washed, fixed with 4% paraformaldehyde for 15 min, and permeabalized with 0.5% saponin (Sigma-Aldrich) for 20 min. The samples were analyzed with the LSRII flow cytometer (BD Biosciences) and FlowJo software with Boolean gates. Fluorescent AS01 was prepared by labeling QS-21 with the fluorophore BODIPY (4,4-difluoro-4-bora-3a,4a-diaza-s-indacene). To label QS-21, an ester derivative of QS-21 (using the glucuronic acid group) was prepared by treating QS-21 (in dimethylformamide) with sulfo-N-hydroxy succinimide and dicyclohexylcarbodiimide, as described previously (13). The QS-21-sulfo-NHS ester derivative was purified by precipitation with ethyl acetate, then dried and suspended in 0.1 M NaHPO4 buffer (pH 7), and reacted with an excess of BODIPY FL-EDA (which bears an amine group, D2390; Life Technologies). The reaction product, QS-21-BODIPY, was purified by semipreparative HPLC and isolated as a powder. The biological activity of QS-21-BODIPY was maintained but lower than the native QS-21 (data not shown). Frozen cryostat sections of tibialis muscle (10 μm) and draining lymph node (dLN) (5 μm) from mice immunized with gE-Alexa Fluor 647/AS01-BODIPY and were fixed in 4% paraformaldehyde (muscle) or acetone (dLN). Ab staining of dLNs (to detect T cells, Armenian hamster anti-mouse CD3ε-PE; and B cells, biotinylated rat anti-mouse CD45R/B220; BD Biosciences) was performed in PBS/2% donkey serum, overnight at 4°C, in conjunction with Dylight594-conjugated streptavidin (for CD45R/B220). Tissue sections were examined with a confocal laser scanning microscope (Zeiss LSM510/780 meta). Minor lightness and contrast adjustments were made using Zeiss and/or other routine image-manipulation software and were applied uniformly to the whole image. Pooled tissues (gastrocnemius muscle or iliac lymph node [ILN]) from three immunized mice were first treated by mechanical dissociation in 3 ml DMEM containing DNase I (100 μg/ml; Roche), 1% FCS and Liberase (Roche) at 0.1 U/ml (muscle), or 0.26 U/ml (ILN) for 30 min under agitation at 37°C (muscle) or at room temperature (ILN). Liberase digestion was stopped by adding 10 mM EDTA and incubating on ice. Larger clumps of material were removed by passing the preparation through a 100 μM nylon cell strainer (BD Biosciences). The muscle preparation was enriched for hematopoietic cells by centrifugation on a Percoll gradient (Amersham-Pharmacia). Cells were washed twice and resuspended in PBS containing 2 mM EDTA and 2% FCS. After treatment with 2.4G2 Ab for 5 min to block the FcR, the cells were stained with the following anti-mouse Abs: anti–Ly6C-FITC, the PE-conjugated lineage identifiers (anti-SiglecF, anti-CD8a, anti-CD4, anti-CD19, and anti-NK1.1), anti–CD86-PE, anti–CD40-PE, anti–CD64-PE, anti–Ly6G-PerCP, anti–Ly6C-PerCP, anti–MHC class II (MHCII) (I-A/I-E)-Alexa700, anti–CD11b-PB, anti–CD11c-PECy7, allophycocyanin-Cy7–conjugated lineage identifiers (anti-CD3, anti-CD19, and anti-Ly6G), and anti–CD45-PO. All Abs were obtained from BD Biosciences. Fluorescent events were acquired using an LSR2 and analyzed using FACSDiva software (BD Biosciences). Monocytes were defined as Ly6ChighCD11b+Ly6G− cells, and neutrophils were defined as SSChighCD11b+Ly6G/Gr1high. After exclusion of neutrophil, monocyte and lymphocyte populations, DCs were gated as CD11c+MHCII+ from muscles or as CD11cmid MHCIIhigh from ILNs. For the assessment of proinflammatory cytokine production, the right gastrocnemius muscle and right iliac lymph node were collected after immunization at the indicated time points and stored at −80°C until further analysis. Organs were pooled from three sets of three mice and four sets of four mice immunized with gE+AS01 or gE alone, respectively. Organs were then homogenized and cytokines were measured in supernatants as described previously (8). Briefly, the homogenates were cleared by centrifugation and stored at −70°C until analysis. Protein levels were measured by cytokine bead array (for TNF-α and IL-1β) or by cytokine-specific beads for all other cytokines using the Luminex platform (Millipore). The levels detected for each cytokine are reported in nanograms or picograms per organ within the homogenate supernatant of the different tissues. C57BL/6 mice (8–10 wk old) were sublethally irradiated (8 Gy) and, 4 h later, received 2 × 106 bone marrow cells i.v. from transgenic (CD11c-diphtheria toxin receptor [DTR]) mouse donors (28). 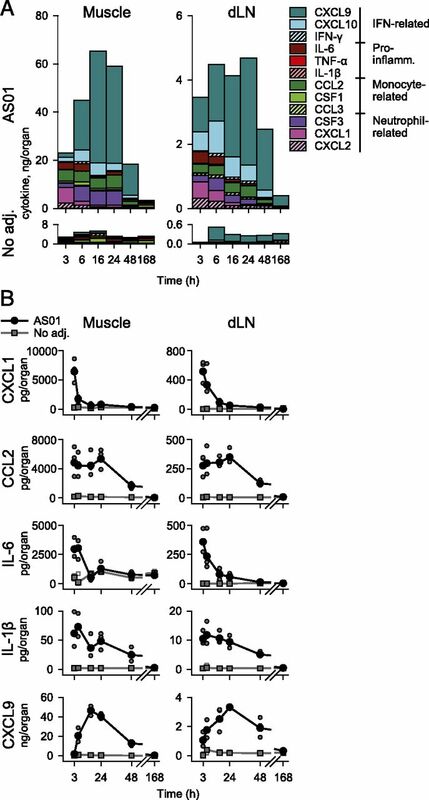 At least 10 wk after bone marrow reconstitution and 12 h before immunization, chimeric mice were depleted of CD11c+ cells by an injection of 200 ng DT or PBS (control) in both gastrocnemius muscles. Chimeric mice (n = 6/group) were immunized in both gastrocnemius muscles (25 μl/muscle) with OVA (0.5 μg) and gE (2.5 μg) in AS01 or PBS. The immunization was performed twice 14-d apart. Ex vivo Ag presentation assays were performed using a protocol adapted from Langlet et al. (29). OVA-specific CD8+ T and CD4+ T cells were isolated from OTI and OTII transgenic mice, respectively, and labeled with CFSE as described previously (19). A total of 25 × 103 OVA-specific T cells were then separately coincubated for 3 d with various numbers of Ly6Chigh monocytes or MHCIIhigh DCs that were purified by cell sorting using a FACSAria (>95% purity) from ILNs of mice previously immunized (24 h before) with OVA (5 μg)/AS01 in each hind leg. OT-I and OT-II proliferation was determined by the loss of CFSE fluorescence by flow cytometry. As controls, APCs were incubated with MHCI- or MHCII-restricted OVA peptides for 45 min at 37°C, washed, and incubated with 25 × 103 OT-I and OT-II, respectively, at various APC:T ratios as indicated, starting with 1:2 ratio. All statistical analyses on cytokine concentrations, Ab concentrations, and T cell frequencies were performed on logarithmic transformed data. The Shapiro–Wilk test was used to evaluate normality. An ANOVA followed by the Tukey’s or Dunnett’s test was applied to identify differences between treatment groups (see figure legends). Statistical significance was assigned when p ≤ 0.05, and in addition for the analysis of Ab concentrations, a condition for which the difference between the groups was also >2-fold was applied. Principal component analysis was used to identify correlations between cytokine and immune cell responses to immunization. Absolute quantities and fold differences of repeated measures described in Results are derived from geometric means. Principal component analysis was performed with SPAD software (version 7; Coheris, Suresnes, France) All other analyses were performed using SAS software (version 9.2; SAS Institute). Fluorescently labeled QS-21 and Ag were incorporated into the gE/AS01 vaccine to monitor the vaccine’s distribution after i.m. injection in situ (Fig. 1). In the muscle, 30 min after injection, QS-21 and the Ag were located in interstitial regions between muscle fibers, mainly in the perimysium (Fig. 1A). At 3 and 24 h, QS-21 and Ag were detected at much lower levels than at 30 min suggesting a rapid clearance from the muscle. Both QS-21 and Ag were also detected in the dLN as early as 30 min, suggesting a rapid drainage from the injection site to the dLN (Fig. 1B). At 30 min, QS-21 was mainly detected in the subcapsular region of the dLN, whereas at 24 h, it was also detected in the medulla. In contrast to QS-21, the Ag was detected deep within the cortical and medullary sinuses at 30 min but was barely detectable at 24 h at the resolution used in this study. Although these data should be interpreted with caution because QS-21-BODIPY may not fully reflect the behavior of unlabeled QS-21 and the whole AS01 formulation, the differences in the localization and dynamics of QS-21 and Ag suggested that the two components were not physically associated and had different pharmacokinetic properties. This concurred with biochemical analyses, which indicated that AS01 was indeed not physically associated with the Ag in the vaccine formulation (data not shown). Because MPL and QS-21 are included in the same liposome, it is possible that MPL has a similar distribution as QS-21, but this was not assessed in this study. (A and B) Localization of fluorescently labeled vaccine components after 30 min, 3 h, and 24 h after immunization with gE-Alexa Fluor 647/AS01 (5 μg gE-Alexa Fluor 647, and AS01 included 5 μg MPL and 5 μg QS-21-BODIPY) in 10-μm [muscle (A)] and 5-μm [dLN (B)] sections. (A) QS-21-BODIPY (green channel) and gE-Alexa Fluor 647 (red channel). (B) QS-21-BODIPY (green channel), gE-Alexa Fluor 647 (red channel), B cells (blue channel), and T cells (white channel). Scale bars, 50 μm (A), 200 μm (B). The kinetics of the innate immune response was examined by measuring a panel of representative proinflammatory cytokines and chemokines, as well as the main innate immune cell subset in the muscle and dLN, over a period of 7 d after the injection of gE/AS01 or gE. The peak induction of all the cytokines considered together typically occurred within 24 h after gE/AS01 injection and was substantially greater (≥8.7-fold) than after Ag injection alone (Fig. 2A). The overall cytokine concentration in the muscle was higher (up to 16-fold at 16 h) than in the dLN. The rapid induction of cytokines by 3 h at the muscle injection site and dLN suggested that cytokines in both locations were induced by resident cells directly stimulated by AS01. This is consistent with a rapid drainage of AS01 from the injection site to the dLN as suggested by the confocal imaging (see Fig. 1). The cytokine levels declined by 48 h and returned to baseline at day 7 (= 168 h), demonstrating the transient nature of the response (Fig. 2A, 2B). More specifically, the pattern of cytokines production was dominated by chemokines rather than proinflammatory cytokines, with monocyte and granulocyte-attracting chemokines (e.g., CCL2 and CXCL1, respectively) and T cell–attracting IFN-dependent CXCL9 and CXCL10. Except for IL-6, the other proinflammatory cytokines examined, IL-1β (Fig. 2B) and TNF-α, were only induced at low levels (<80 pg/organ). Although most cytokines peaked at early time points (either 6 or 24 h) and subsided rapidly (e.g., CXCL1 and IL-6), others subsided only between days 2 and 7 (e.g., CXCL9 and CCL2) (Fig. 2A, 2B). Furthermore, neither IL-12p70 nor IFN-α was detected above baseline levels (data not shown). The pattern of the inflammatory response was similar overall between muscle and dLN, except for CXCL9 and CXCL10, which were more rapidly increased at 3 h in the dLN than in the muscle. AS01 induced a rapid and transient production of cytokines at the injection site and dLNs. (A and B) Geometric mean cytokine concentrations (n = 3); in muscle (injection site; left graphs) or in draining lymph node (right graphs) homogenates at 3, 6, 24, 48, and 168 h (= day 7) postimmunization of AS01 (1 μg MPL and 1 μg QS-21)-adjuvanted or unadjuvanted (No adj.) gE-Alexa Fluor 647 (2 μg) Ag. (B) Both geometric mean cytokine concentrations (black circles, gE/AS01; gray squares, gE/[No adj.]) and individual cytokine concentrations (gray circles, gE/AS01; white squares, gE/[No adj.]) are described for selected cytokines. These data showed that AS01 induced an inflammatory response at the injection site and dLN, characterized by the production of chemokines and IFN-pathway–related cytokines. This inflammatory response was transient and subsided by 7 d.
Immune cell numbers were evaluated by enzymatic digestion of muscle injection sites and dLNs, followed by cell phenotyping using flow cytometry (Fig. 3). AS01 induced a transitory increase in innate immune cell numbers in the muscle (A and B) and dLN (C and D), 3–168 h (= day 7) postimmunization of AS01 (1 μg MPL and 1 μg QS-21)-adjuvanted or unadjuvanted (No adj.) gE-Alexa Fluor 647 (2 μg) Ag. (A–C) Geometric mean cell number/tissue (n = 3) of (CD45+) immune cells including monocytes (Lin−CD11b+Ly6Chigh), neutrophils (SSChighLy6G+), and DCs (CD11c+MHCII+ in muscle and CD11c+MHCIIhigh in the dLN). (E) The immune cell and cytokine kinetics (shown in Fig. 3) were examined using principal component analysis (PCA). The principal components 1, 2, and 3 (represented by the x, y, and z axes, respectively, in the three-dimensional scatter plot) accounted for 73 and 88% of the variation in the injection site (muscle; upper scatter plot) and dLN (lower scatter plot) data sets, respectively. Neutrophils (N) are depicted by cyan triangles. Other cell types are depicted by gray triangles (B, B cells; mDC, MHCIIhigh DCs; rDC, MHCIImed DCs; M, monocytes; and T&NK, T and NK cells). Cytokines clusters with potential associations with neutrophils are depicted by purple circles (see also Supplemental Table I) and include (IL-6, IL-1β, TNF-α, CXCL1, CXCL2, CXCL10, CCL2, and CCL3 in muscle and IL-1β, TNF-α, CXCL2, CXCL9, CXCL10, CCL2, CCL3, CSF1, and CSF3 in the dLN). Other cytokine clusters are depicted by green circles. In the muscle and consistent with the chemokine profile (see Fig. 2), monocyte (Lin−CD11b+Ly6Chigh) and neutrophils (SSChighLy6G+) were the most prominent immune cell types whose numbers were transiently elevated after the injection of gE/AS01 compared with Ag alone (Fig. 3A, 3B). Lymphocytes numbers were relatively low during the period investigated. At 3 h, the number of neutrophils was 9.5-fold higher with gE/AS01 than with Ag alone, and at 6 h, the numbers of monocytes and neutrophils peaked and were 4.9- and 13-fold higher, respectively, with gE/AS01 than with Ag alone. In comparison, the number of DCs (Lin−, CD11c+MHCII+) was low with no significant changes during the period investigated. At day 7, the respective numbers of immune cells were not different after the injection of gE/AS01 or Ag alone, suggesting that the local inflammatory reaction at the injection site fully resolved by 7 d.
In the dLN and at 6–48 h, the total number of immune cells was greater after the injection of gE/AS01 than after Ag alone (Fig. 3C, 3D). A 3.4- to 4-fold increase in lymphocytes was observed as early as 3 h after injection. In contrast to the muscle, the number of myeloid cells only represented a minority of the total population (1–7%) in the dLN. However, the numbers of neutrophils, Ly6Chigh monocyte, and DCs (defined as CD11cmid MHCIIhigh cells, furthermore defined as MHCIIhigh DCs) were higher by up to 53-, 230-, and 8.6-fold, respectively, after the injection of gE/AS01 compared with Ag alone (Fig. 3D). The early increase in the number of neutrophils at 3 h was consistent with the rapid appearance of neutrophil chemoattractants (CXCL1; see Fig. 2). At day 7, lymphocytes accounted for the remaining increase in cell numbers in the dLN, whereas myeloid cell numbers returned to baseline levels. The increase in the number of DCs was apparent from 16 h and consistent with the migration of muscle resident DCs into the dLN observed by Langlet et al. (29) after the i.m injection of alum. Multicomponent analysis was further performed to correlate the kinetics of the various cytokines with cell numbers (Fig. 3E, Supplemental Table I). Neutrophil kinetics in the muscle was associated (correlation coefficient r > 0.5) with a number of cytokines, including IL-6, TNF-α, and IL-1β, as well as two known neutrophil-attracting cytokines (CXCL2 and CXCL1), suggesting that early proinflammatory signals were associated with rapid neutrophil migration to the injection site. However, in the dLN, neutrophil kinetics was associated with a different but overlapping set of cytokines than in the muscle, suggesting a different mechanism regulating the increase in neutrophil number in the dLN. In contrast to neutrophil kinetics, the kinetics of the other immune cell types in the muscle and dLN were not so clearly associated with any of the cytokines examined, suggesting that the behavior of these cells was governed by a more complex pattern of signals. In particular, monocyte recruitment did not seem to be associated with CCL2 in this model. To investigate the time window in which the kinetics of the innate immune responses relate to the adaptive immune responses, AS01 was first injected followed by gE at different intervals [from 0 to 72 h at the same location in the muscle (Fig. 4, left graphs)]. Two weeks after immunization, Ag-specific Ab and T cell responses were measured. When the Ag and AS01 were injected at the same time in the same site, either separately or premixed, the respective Ab and T cell responses were not different. However, these Ab and T cell responses were >13,000- and >5.5-fold higher, respectively, than after the injection of Ag alone. The adaptive immune responses were also high when the Ag was injected 1 h after AS01 instead of at the same time. However, the adaptive responses were substantially lower when the Ag was injected 24 or 72 h after AS01 (Ab responses, 6- and 540-fold lower, respectively, and T cell responses, 5.3- and 6-fold lower, respectively). With the 72-h separation between injections, the T cell response was not different from that induced by Ag alone, although the Ab response was 24-fold higher than that induced by Ag alone. However, this difference in Ab responses was not observed when 5-fold lower amounts of AS01 and Ag were used (Supplemental Fig. 1). High Ab and T cell responses were dependent on the Ag being injected at the same site and within 24 h after AS01. Ag-specific Ab concentrations (upper graphs; n = 26, left; n = 16, right) and CD4+ T cell responses (percentage of gE-specific CD4+ T cells with respect to all CD4+ T cells; lower graphs; n = 13, left; n = 8, right) in splenocyte cultures derived from mice subject to different injection regimes. The cytokine expression profile (IL-2, IFN-γ, or both) of the gE-specific CD4+ T cells are indicated by differences in shading. The values from mice injected with AS01 and Ag together in the same syringe are indicated by hatched bars. The adaptive responses were measured 30 d after the second immunization. The Ag was 5 μg gE and AS01 included 5 μg MPL and 5 μg QS-21. Histograms represent geometric means, and error bars represent 95% confidence intervals. Highlighted statistical relationships are indicated by horizontal lines, either between the coinjection of AS01 and Ag and other regimes (black lines) or between the injection of Ag alone and other regimes (gray lines). ***p < 0.001. To investigate the spatial relationship between the innate immune responses and the adaptive responses, the Ag was injected in the limb contralateral to that in which AS01 was injected (Fig. 4, right graphs). Ag-specific Ab and T cell responses were substantially lower (110- and 4.4-fold, respectively) when gE was injected in the contralateral site rather than the same site as AS01 (Fig. 4, right graphs). Although the T cell response was not different from that when Ag was injected alone, the Ab response was slightly higher. However, this difference in Ab responses was not observed when 5-fold lower amounts of AS01 and Ag were used (Supplemental Fig. 1). These results indicated that maximal Ag-specific T cell and Ab responses required the Ag to be injected at the same site together with AS01 and within 24 h. This is consistent with the rapid clearance of Ag and adjuvant at the injection site, as shown by confocal imaging (Fig. 1). This also suggested that elements of the innate immune response that were triggered by AS01 within 24 h and local to the injection site potentially contributed to the increased magnitude and quality of the adaptive responses. This limited time window seemed to be more critical for the induction of T cell response than for Ab response. The increased activity of APCs in the dLN could explain how the activation of innate immunity by AS01 translates into enhanced Ag-specific adaptive immune responses. Ag-carrying innate immune cells were identified using fluorescently labeled gE Ag, even though the method could have underestimated their number because of the anticipated loss of fluorescence with Ag degradation after uptake (Fig. 5A, 5B). Higher numbers of Ag+ monocyte, MHCIIhigh DCs, and neutrophils were detected up to 48 h after immunization with gE/AS01 than with Ag alone (Fig. 5A). At early time points, neutrophils were the main Ag-loaded cells, but their numbers rapidly subsided. After 24 h, Ag+ monocytes were 10 times more frequent than Ag+MHCIIhigh DCs. Also Ag+ monocytes were 22% of all monocytes, whereas Ag+MHCIIhigh DCs were 4% of all MHCIIhigh DCs. In contrast to other adjuvants such as alum or emulsion in the same model (8, 30), AS01 did not increase the amount of Ag detected per cell as measured by mean fluorescence intensity of Ag+ cells (Fig. 5B). However, monocyte and MHCIIhigh DCs expressed higher levels of the costimulatory molecule CD86 and CD40 at 24 h after the injection of gE/AS01 than after Ag alone (Fig. 5C). The expression of CD40 and CD86 returned to baseline levels at day 7, consistent with the transient nature of the AS01-dependent innate immune response. Therefore, coadministration of AS01 with the Ag increased the number of Ag-carrying and activated APCs without a clear increase in their capacity to take up Ag. DCs and monocytes were activated and took up Ag after immunization. (A) Geometric mean Ag+ cell number/dLN (n = 3) of monocyte (CD11b+Ly6Chigh), DCs (CD11c+MHCIIhigh), and neutrophils (SSChighLy6G+), 3–168 h after immunization with gE (2 μg; No adj.) or gE/AS01 (AS01; 1 μg MPL and 1 μg QS-21). (B) Geometric mean Ag staining intensity (mean fluorescence intensity [MFI], n = 3) of monocytes and DCs, 24 h after immunization with gE (No adj. ), or gE/AS01 (AS01). (C) Geometric mean CD86 staining intensity (MFI, n = 3) of monocytes and DCs 24, 48, and 168 h after immunization with gE (No adj.) or gE/AS01 (AS01). (D) Representative flow cytometry outputs of monocyte and DCs taken from the dLN 24 h postimmunization with gE (No adj.) or gE/AS01 (AS01) revealing heterogeneous populations of cells, based on further subdivisions according to the expression of CD11c and MHCII (within monocytes Ly6Chigh) and migratory DCs (CD11b, CD24, and CD64). The geometric mean percentage (and SD) of MHCIIhigh-DC numbers within a given phenotyped subpopulation over all MHCIIhigh DCs is indicated adjacent to the respective outlined subpopulation and was calculated from four repeat cell-sorting runs using the same source material. *Note that a population of resident DCs was only clearly identified with the CD11c+MHCIImed gate after immunization with gE without AS01. Both DCs and monocyte populations are heterogeneous (Fig. 5D) (31, 32). At 24 h after immunization with gE/AS01, a substantial proportion of Ly6Chigh monocytes expressed CD11c and MHCII, showing that AS01 affected the differentiation of monocytes in situ. The MHCIIhigh DCs population contained cells that expressed CD11b and CD64 that are both markers of monocyte-derived DCs (33), suggesting that, in addition to the classical CD24+ DCs (also known as CD8a+ DCs) and CD11b+CD64− DCs, a proportion of DCs were derived from monocytes (29, 34). Given that those Ly6C−CD64low monocyte-derived DCs were part of the MHCIIhigh population (see Fig. 5D), they expressed higher levels of MHCII than Ly6Chigh monocytes. This transition of monocytes into DCs was more apparent in the dLNs from mice injected with gE/AS01 than with gE alone (i.e., 13% compared with 4% of CD11b+CD64+ cells in the Ly6C−CD11c+MHCIIhigh population). Whether these differentiated monocytes originated from the muscle after extravasation or directly from blood was not assessed. In the dLN after the injection of gE alone, the CD11c+ DCs could also be resolved into two distinct populations by the relative expression level (medium or high) of MHCII. The MHCIImedium population (Fig. 5D, asterisk in nonadjuvant group) reflected a LN-resident DC population that was not apparent 24 h after the injection of gE/AS01, suggesting that AS01 may have directly induced higher levels of MHCII in this population. Therefore, AS01 broadened the heterogeneity of MHCIIhigh DCs population in the dLNs to contain bona fide DCs (either resident or migrating from the muscle injection site) and monocyte-derived DCs. To examine the ability of the different APC subsets to present Ag to cognate T cells, two murine models were used (5): one that measured responses after DT-mediated CD11c+ cell depletion and a second that measured the ability of purified APC population to present OVA to cognate–T cell ex vivo. OVA was confirmed as a suitable model Ag because i.m. immunization with OVA/AS01 compared with OVA alone increased OVA-specific CD4+ and CD8+ T cell frequencies (Supplemental Fig. 2A). Restimulation with OVA peptide pools of splenocytes from OVA/AS01-immunized mice also indicated that both Th1 (IFN-γ) and Th2 cytokines (IL-5 and IL-13) were induced, although the cytokine response was largely shifted toward Th1 compared with OVA/Alum-immunized mice (Supplemental Fig. 2B). CD11c+ cell depletion was achieved by injecting DT into animals that had bone marrow transplants from mice transgenic for DTR driven by the CD11c promoter (35). Transgene expression rendered the cells sensitive to the lethal effect of DT. Using an immunization protocol combining both Ags, gE and OVA, gE-specific and OVA-specific CD4+ and CD8+ T cell responses were higher with gE-OVA/AS01 than with gE-OVA alone (Fig. 6A), in line with the other immunizations in wild type (WT) mice (see Fig. 4, Supplemental Fig. 2A, 2B). The injection of DT 12 h before gE-OVA/AS01 immunization abrogated both CD4+ and CD8+ OVA and gE-specific responses (Fig. 6A), indicating that CD11c+ cells were necessary for the induction of the Ag-specific T cell responses to vaccines adjuvanted with AS01. T-cell responses to immunization were dependent on CD11c+ MHCIIhigh DCs. (A) Geometric mean Ag-specific T cell responses (n = 6/group) 7 d after the second immunization with gE + OVA or gE + OVA/AS01 (OVA, 1 μg; gE, 5 μg; and AS01 included 5 μg MPL and 5 μg QS-21) in wild type mice containing bone marrow transplants from transgenic (CD11c-DTR) mice and treated with (+) or without (−) injection of DT 24 h before immunization. (B) Representative flow cytometry histograms of OTII CD4+ T cell and OTI CD8+ T cell activation measured in terms of loss of cell cytosolic CFSE fluorescence (because of proliferation) after ex vivo coculturing with DCs (CD11c+MHCIIhigh) or monocytes (CD11b+Ly6chigh) taken 24 h after immunization with OVA/AS01 (5 μg OVA and AS01 included 1 μg MPL and 1 μg QS-21) in different ratios starting at two T cells to one APC. Green and purple areas under the curves denote proliferating and nonproliferating cell populations, respectively. (C) Quantification of OT-II and OT-I cell divisions with respect to different ratios of T cells to APCs. Because both MHCIIhigh DCs and a subset of Ly6C+ monocytes express CD11c (see Fig. 5D), the ability of those two APC subsets to directly present Ag (OVA) to T cells was assessed ex vivo using OTII and OTI T cells. Cells were isolated by cell sorting from dLNs 24 h after immunization with OVA/AS01 (Supplemental Fig. 2C, 2D). As shown for the gE Ag in Fig. 5A, the proportion of OVA+ cells after injection of fluorescent OVA/AS01 had been found to be higher in the monocyte population than in the DC population (25–34 versus 4–9%). OTII- or OTI-proliferation after 3 d of coculture (measured by the decrease of the CFSE fluorescent cytosolic dye) was used as a readout of Ag presentation. MHCIIhigh DCs from mice immunized with OVA/AS01 substantially induced both CD4+ and CD8+ T cell proliferation in a T cell:DC ratio dependent manner (Fig. 6B, 6C). In contrast, Ly6C+ monocytes (which excludes monocyte-derived DCs) from mice immunized with OVA/AS01 did not induce significant CD4+ T or CD8+ T cell proliferation at any ratio. Pulsing those monocytes with OVA peptides restored CD8+ but not CD4+ T cell proliferation (data not shown), demonstrating that these cells were not able to present Ag to CD4+ T cells, even in the presence of excess peptides loaded onto MHCII molecules. 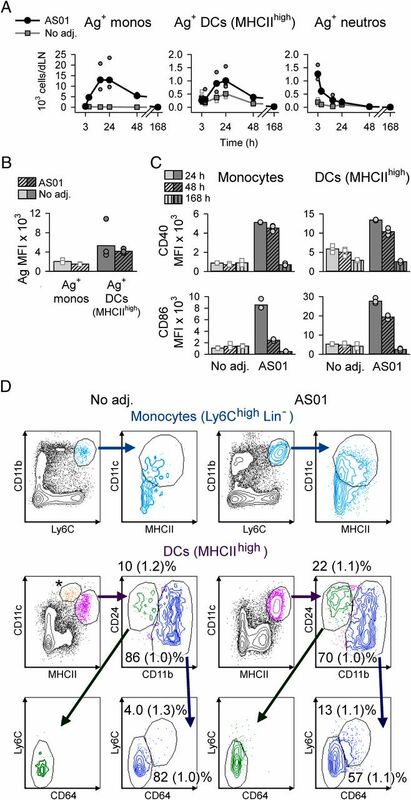 This suggests that AS01 enhanced the ability of MHCIIhigh DCs to present Ag to T cells but not monocytes, even though monocytes were the main cell type carrying Ag in the dLN (see Fig. 5A), and expressed MHCII and costimulatory molecules (see Fig. 5C, 5D, Supplemental Fig. 2C). Therefore, because AS01 increased the number of MHCIIhigh DCs in the dLN, as well as their ability to efficiently prime T cells, these DCs were likely to be responsible for most of the T cell response after immunization with an AS01-adjuvanted vaccine. T cell activation did not appear to require an increase in Ag loading per se but was associated with the increased activation of DCs, as suggested by the elevated expression of CD40 and CD86. Although Ly6C+ monocytes were unable to efficiently activate T cells, DCs derived from monocytes (Ly6C−CD11c+MHCIIhighCD11b+CD64+) that are included in the MHCIIhigh DC population may have contributed to T cell priming. Adjuvant System AS01 contains two immunostimulants, MPL and QS-21, in a liposome formulation. After its injection, the expected impact on the innate immune response was clearly demonstrated in the mouse models used in this study. This innate immune response was rapid and transient in both the injected muscle and dLN, and reflected to a large degree, the rapid drainage of the Ag and the adjuvant from the muscle to the dLN. 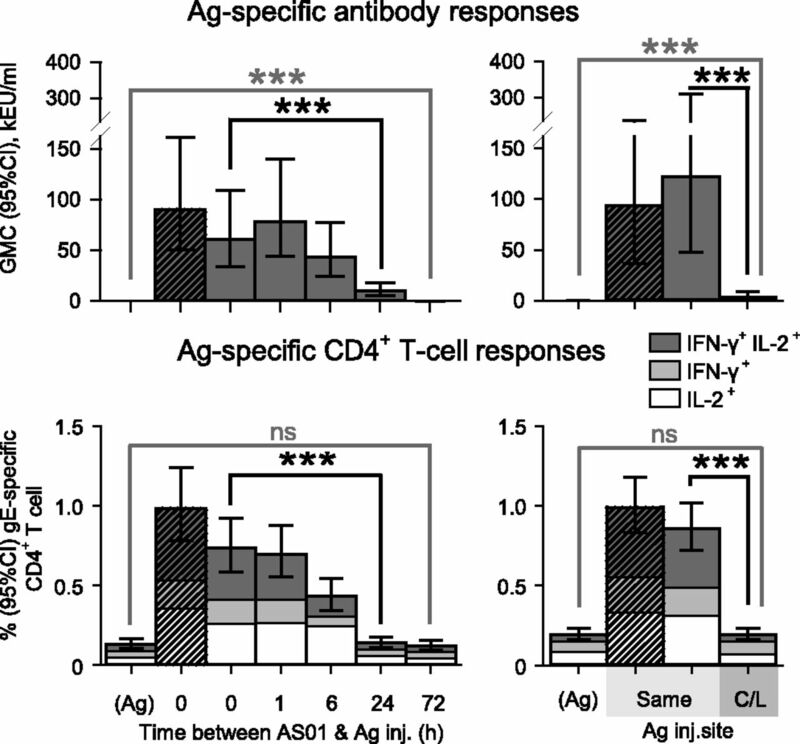 The significance of this innate response was supported by the observation that the enhanced Ag-specific B and T cell responses were largely dependent on the Ag being injected at the same location as AS01 within 24 h. Several innate immune parameters induced by AS01 may explain its ability to promote adaptive immune responses. First, AS01 increased the number of APCs that were efficient at priming T cells in the dLN. These APCs were within the MHCIIhigh DC population and were identified in ex vivo presentation assays and in an in vivo transgenic CD11c+ cell depletion model. Among other mechanisms, the activation of this DC population, reflected by elevated expression levels of costimulatory molecules, may have directly contributed to T cell–priming efficiency (36, 37). However, unlike other adjuvants such as oil-in-water emulsions, MPL, or alum-containing adjuvant AS04 (8, 30, 38), AS01’s adjuvant effect was not associated with an increased uptake of Ag by DCs or with an Ag depot effect. The DC population included tissue-resident DCs that migrated to the dLN upon activation and monocyte-derived DCs, similar to what has been shown before with a LPS adjuvant, as well as with alum adjuvant injected via the peritoneal route (5, 29, 39). Indeed, MPL in AS01 may have directly activated muscle-resident DCs (8) and could also have enhanced the differentiation and migration of monocyte-derived DCs (29). Second, the rapid and concomitant free-flow of AS01 and Ag to the dLN was likely to have affected the magnitude of the adaptive response. 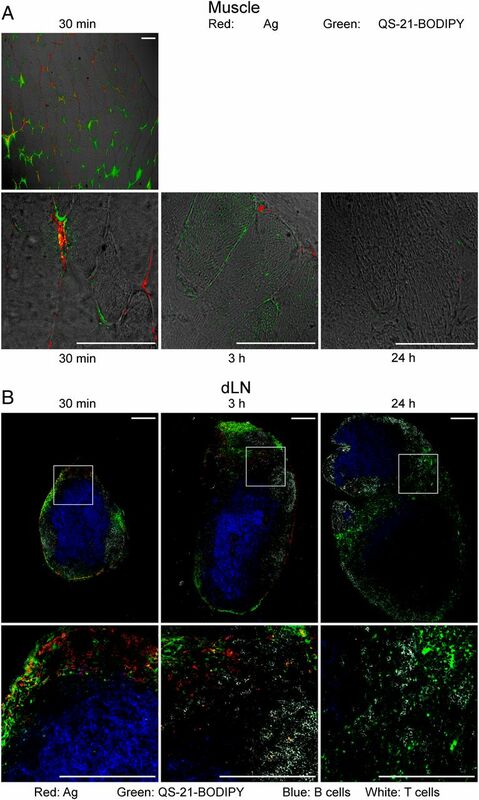 Resident DCs in the dLN may have been directly activated by AS01 (or indirectly by the inflammatory milieu) and may therefore provide an early signal to cognate T cells, before the accumulation of the migratory DCs. The rapid activation of DCs at a stage when the Ag was most readily available to be endocytosed (i.e., soon after immunization) may be an additional key factor in establishing a strong T cell response. This is suggested by Kamath et al. (40) who recently demonstrated that, in the converse situation, the early recruitment of nonactivated Ag-loaded APCs with in the dLN may be detrimental for Th1 responses. Given that high adaptive responses were achieved even when Ag was injected hours after AS01, our study shows that high adaptive responses can be associated with a rapid induction of inflammation and APC activation and may not require a physical association between adjuvant and Ag. Third, in the dLN, the rapid recruitment of naive T cells was likely to have further enhanced the frequency of T and APC interactions (41), thereby supporting Ag presentation. This may be explained by the early activation of resident DCs in the dLN, as shown by others (42). The CXCR3 ligands CXCL9 and CXCL10 are often associated with Th1 responses (43) and were prominent among the cytokines detected in the dLN. The expression of both chemokines by LN stromal cells and DCs may have enhanced Th1 responses by creating a favorable environment facilitating T cell priming at the periphery of the dLN (44). Fourth, other innate immune effectors also may have modulated the adaptive response. Neutrophils were rapidly recruited at the injection site and in the dLN after immunization with AS01-adjuvanted vaccine. Although not assessed in this study, neutrophils have been reported to have either no effect or a detrimental effect on the adaptive response (45, 46). Nevertheless, neutrophils may play a role in controlling the degree of local inflammation and participate in Ag clearance (47). Monocytes were the largest population of innate immune cells recruited after immunization with gE/AS01. Monocytes may play a critical role in the resolution of inflammation at the injection site by differentiating locally into macrophages (48). This is supported by the absence of inflammatory cells and cytokines in the muscle 1 wk postimmunization with gE/AS01, suggesting a full recovery of the injected muscle. Although some of the Ly6chigh monocytes expressed MHCII and costimulatory molecules and were loaded with Ag, most of these cells were unable to prime T cells efficiently, in line with previous reports (29, 49, 50). An immunomodulatory role of those monocytes in AS01 mode of action remains to be investigated. Indeed, monocytes may have supportive roles, such as helping DCs in directing Th1 differentiation of CD4+ T cells (51) or in activating CD8+ memory T cells and NK cells (52), but may have had also a suppressive role, as reported recently (53). Both MPL and QS-21 in AS01 have been associated with enhancing Ab and T cell responses after immunization (19) and may affect the innate immune responses differently. In our study, the induction of a number of cytokines (e.g., IL-6, CCL2, and CCL3) may have been dependent on MPL (8), whereas the induction of IL-1β may have been due to QS-21 because IL-1β induction is associated with the activation of the inflammasome, and the activation of the inflammasome has been observed with QuilA (54). In addition, QS-21 is likely to have played a role in CD8+ T cell induction in the mouse model used in this study, perhaps mediated by a particular population of DCs, as reported recently (35). The contributory roles of MPL and QS-21 in the response are currently under investigation. AS01 has been selected in a number of human vaccine candidates because of its association with enhanced immune responses, both humoral and cellular (2, 19, 55). Recently, the RTS,S vaccine was shown to confer protection of 30–47% against uncomplicated and severe malaria in young African children and infants, respectively (17, 18). Although one difference between mice and human is the lack of detectable CD8+ T cell responses in humans (21, 22, 25), the results described here now provide insights into the role of AS01 in generating protective vaccine responses in humans, particularly through its ability to generate a strong cellular response. The features of AS01’s adjuvant activity that are likely to be relevant in humans are the transient activation of an innate response at the site of injection, the induction of a specific pattern of cytokines, and the generation of a heterogeneous DC population in the dLN that is efficient at priming T cells. Hence, the details on AS01’s adjuvant activity identified in this study may help in the further development of human vaccine adjuvants required for promoting Ag-specific cell-mediated responses as well as Ab responses. A.M.D., C.C., P.B., S.W., M.F., N.D., C.L., N.G., M.V.M., and S.M. are employees of the GlaxoSmithKline group of companies. A.M.D., P.B., N.D., N.G., M.V.M., and S.M. own GlaxoSmithKline stocks. N.G. is listed as an inventor on patents owned by GlaxoSmithKline. B.M., K.F., and B.N.L. report no financial conflicts of interest. We thank Nabila Amanchar, Stephanie Quique, Hajar Larbi, Aurélie Chalon, and Karine Gillard for providing technical support, Kendal Ryter for generating fluorescent (BODIPY-labeled) QS-21, and Frédéric Renaud and Gaël de Lannoy (all at GlaxoSmithKline Vaccines) for performing the statistical analyses. We thank Sandra Giannini for providing advice with the design and interpretation of experiments evaluating spatiotemporal relationships between AS01 and Ag and Catherine Gérard, Caroline Hervé, Margherita Coccia, Lode Schuerman, and Robbert Van der Most (all at GlaxoSmithKline Vaccines) for providing constructive and scientifically critical reviews of the manuscript. We also thank Mirjam Kool, Hamida Hammad, and Martin Guilliams (Vlaams Instituut voor Biotechnologie, Ghent University) for providing advice in the design and interpretation of the transgenic (CD11c-DTR) bone marrow mouse chimera experiments, Matthew Morgan (MG Science Communications) for providing scientific writing services, and Ulrike Krause (GlaxoSmithKline Vaccines) for providing editorial advice and coordinating the manuscript’s development. This work was supported by GlaxoSmithKline Biologicals SA.
. 2011. Recent clinical experience with vaccines using MPL- and QS-21‑containing adjuvant systems. Expert Rev. Vaccines 10: 471–486.
. 2011. Combination adjuvants: the next generation of adjuvants? Expert Rev. Vaccines 10: 95–107.
. 2009. Mechanism of action of clinically approved adjuvants. Curr. Opin. Immunol. 21: 23–29.
. 2008. Monophosphoryl lipid A and synthetic lipid A mimetics in TLR4-based adjuvants and immunomodulators. In Vaccine Adjuvants: Immunological and Clinical Principles. Hackett C. J., D. A. Harn Jr.., eds. Humana Press Inc., Totowa, NJ, p. 235–255.
. 2000. The adjuvant monophosphoryl lipid A increases the function of antigen-presenting cells. Int. Immunol. 12: 807–815.
. 2009. AS04, an aluminum salt- and TLR4 agonist-based adjuvant system, induces a transient localized innate immune response leading to enhanced adaptive immunity. J. Immunol. 183: 6186–6197.
. 2002. Monophosphoryl lipid A activates both human dendritic cells and T cells. J. Immunol. 168: 926–932.
. 1991. Separation and characterization of saponins with adjuvant activity from Quillaja saponaria Molina cortex. J. Immunol. 146: 431–437.
. 2011. Natural and synthetic saponin adjuvant QS-21 for vaccines against cancer. Expert Rev. Vaccines 10: 463–470.
. 1998. QS-21: a water-soluble triterpene glycoside adjuvant. Expert Opin. Investig. Drugs 7: 1475–1482.
. 1995. Structure/function studies of QS-21 adjuvant: assessment of triterpene aldehyde and glucuronic acid roles in adjuvant function. Vaccine 13: 1403–1410.
. 1994. Phase 1 trial of immunological adjuvant QS-21 with a GM2 ganglioside-keyhole limpet haemocyanin conjugate vaccine in patients with malignant melanoma. Vaccine 12: 1275–1280.
. 2009. ISCOMATRIX adjuvant induces efficient cross-presentation of tumor antigen by dendritic cells via rapid cytosolic antigen delivery and processing via tripeptidyl peptidase II. J. Immunol. 182: 1253–1259.
. 2011. ISCOMATRIX adjuvant combines immune activation with antigen delivery to dendritic cells in vivo leading to effective cross-priming of CD8+ T cells. J. Immunol. 187: 55–63.
. 2011. First results of phase 3 trial of RTS,S/AS01 malaria vaccine in African children. N. Engl. J. Med. 365: 1863–1875.
. 2012. A phase 3 trial of RTS,S/AS01 malaria vaccine in African infants. N. Engl. J. Med. 367: 2284–2295.
. 2011. An adjuvanted polyprotein HIV-1 vaccine induces polyfunctional cross-reactive CD4+ T cell responses in seronegative volunteers. Clin. Infect. Dis. 52: 522–531.
. 2010. Strong and persistent CD4+ T-cell response in healthy adults immunized with a candidate HIV-1 vaccine containing gp120, Nef and Tat antigens formulated in three Adjuvant Systems. Vaccine 28: 7016–7024.
. 2013. Improved CD4+ T cell responses to Mycobacterium tuberculosis in PPD-negative adults by M72/AS01 as compared to the M72/AS02 and Mtb72F/AS02 tuberculosis candidate vaccine formulations: a randomized trial. Vaccine 31: 2196–2206.
. 2009. Randomized, double-blind, phase 2a trial of falciparum malaria vaccines RTS,S/AS01B and RTS,S/AS02A in malaria-naive adults: safety, efficacy, and immunologic associates of protection. J. Infect. Dis. 200: 337–346.
. 2012. A statistical interaction between circumsporozoite protein-specific T cell and antibody responses and risk of clinical malaria episodes following vaccination with RTS,S/AS01E. PLoS One 7: e52870.
. 2011. Circumsporozoite-specific T cell responses in children vaccinated with RTS,S/AS01E and protection against P falciparum clinical malaria. PLoS One 6: e25786.
. 2013. Four-year efficacy of RTS,S/AS01E and its interaction with malaria exposure. N. Engl. J. Med. 368: 1111–1120.
. 2009. Evaluation of RTS,S/AS02A and RTS,S/AS01B in adults in a high malaria transmission area. PLoS ONE 4: e6465.
. 2002. In vivo depletion of CD11c+ dendritic cells abrogates priming of CD8+ T cells by exogenous cell-associated antigens. Immunity 17: 211–220.
. 2012. CD64 expression distinguishes monocyte-derived and conventional dendritic cells and reveals their distinct role during intramuscular immunization. J. Immunol. 188: 1751–1760.
. 2011. Adjuvant System AS03 containing α-tocopherol modulates innate immune response and leads to improved adaptive immunity. Vaccine 29: 2461–2473.
. 2010. From skin dendritic cells to a simplified classification of human and mouse dendritic cell subsets. Eur. J. Immunol. 40: 2089–2094.
. 2014. The function of Fcγ receptors in dendritic cells and macrophages. Nat. Rev. Immunol. 14: 94–108.
. 2012. Re(de)fining the dendritic cell lineage. Nat. Immunol. 13: 1145–1154.
. 2012. ISCOMATRIX vaccines mediate CD8+ T-cell cross-priming by a MyD88-dependent signaling pathway. Immunol. Cell Biol. 90: 540–552. 2010. Dynamics of dendritic cell‑T cell interactions: a role in T cell outcome. Semin. Immunopathol. 32: 227–238.
. 2005. Antigen persistence is required throughout the expansion phase of a CD4+ T cell response. J. Exp. Med. 201: 1555–1565.
. 2012. The mechanism of action of MF59—an innately attractive adjuvant formulation. Vaccine 30: 4341–4348.
. 2012. Synchronization of dendritic cell activation and antigen exposure is required for the induction of Th1/Th17 responses. J. Immunol. 188: 4828–4837.
. 2005. Innate control of adaptive immunity via remodeling of lymph node feed arteriole. Proc. Natl. Acad. Sci. USA 102: 16315–16320.
. 2012. HEVs, lymphatics and homeostatic immune cell trafficking in lymph nodes. Nat. Rev. Immunol. 12: 762–773.
. 2002. The CXC chemokine murine monokine induced by IFN-γ (CXC chemokine ligand 9) is made by APCs, targets lymphocytes including activated B cells, and supports antibody responses to a bacterial pathogen in vivo. J. Immunol. 169: 1433–1443.
. 2011. Vaccine adjuvants alum and MF59 induce rapid recruitment of neutrophils and monocytes that participate in antigen transport to draining lymph nodes. Vaccine 29: 1812–1823.
. 2010. Differentiation and function of mouse monocyte-derived dendritic cells in steady state and inflammation. Immunol. Rev. 234: 90–104.
. 2011. T-zone localized monocyte-derived dendritic cells promote Th1 priming to Salmonella. Eur. J. Immunol. 41: 2654–2665.
. 2012. Inflammatory monocytes activate memory CD8+ T and innate NK lymphocytes independent of cognate antigen during microbial pathogen invasion. Immunity 37: 549–562.
. 2012. Suppression of vaccine immunity by inflammatory monocytes. J. Immunol. 189: 5612–5621.
. 2008. Vaccine adjuvant systems containing monophosphoryl lipid A and QS21 induce strong and persistent humoral and T cell responses against hepatitis B surface antigen in healthy adult volunteers. Vaccine 26: 1375–1386.